LiveCode LessonsLiveCode LessonsHow To - LiveCode Mobile Tasks iOS TasksHow do I play sounds on an iOS device? In this lesson we'll look at how to play an audio file from a LiveCode stack running on a mobile device. Well focus on how to add sounds to alerts and the use of the 'play' command. Support has been added for the beepSound and beep commands. 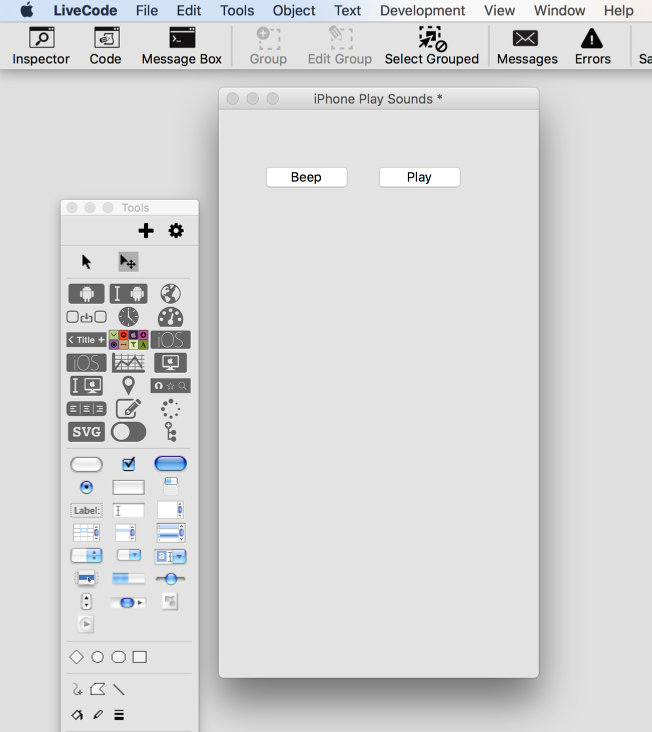 These hook into iPhoneOS's standard PlayPlayerSound support. To specify a sound to be played as the system sound, use the beepSound global property. This should be set to the filename of the sound to use when beep is executed. If you want no sound to play when using beep, simply set the beepSound to empty. To perform a system alert, use the beep command. If no sound has been specified via the beepSound global property, the engine will request a vibration alert. Note: The iPhone has no default system alert sound so if a sound is required one must be specified by using the beepSound. The action of beep is controlled by the system and depends on the user's preference settings. In particular, a beep will only cause a vibration if the user has enabled that feature. Similarly, a beep will only cause a sound if the phone is not in silent mode. set the beepsound to "empty"
Note: You will need to deploy this to your iPhone in order to test it. 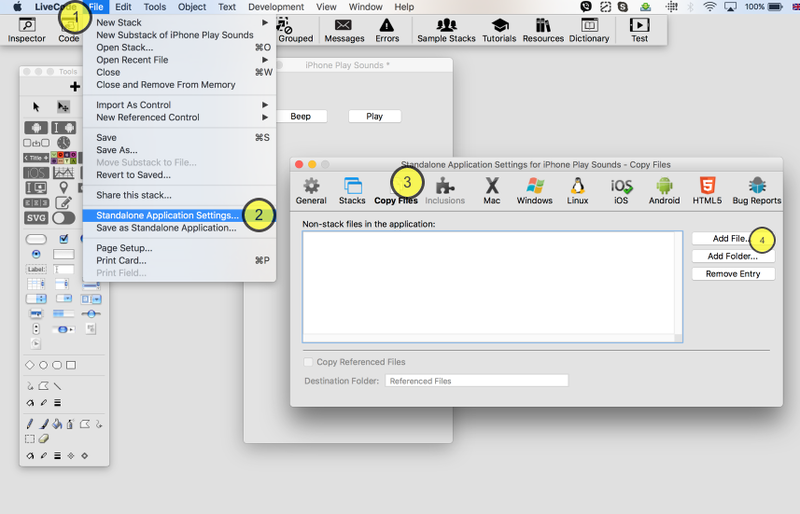 This script will cause your iPhone to vibrate if you have that enabled. 5) Now just browse to your sound file and click OK. Thie file will appear in the list and be added to your app bundle when you save the standalone. Now that we have a sound file ready for bundling into our app we can add the script to use it. set the beepsound to specialFolderPath("resources") & "/sound.mp3"
* To test you will need to deploy this to your device. Executing such a command will first stop any currently playing sound, and then attempt to load the given sound file. If looping is specified the sound will repeat forever, or until another sound is played. If the sound playback could not be started, the command will return “could not play sound” in the result. The volume at which a sound is played can be controlled via the playLoudness global property. specific) and as such has support for a variety of formats including AIFF and MP3's. command be sure to test your application on a real device. Prev: How do I use the Question and Password Dialogues in iOS? Next: How do I Access Maps on iOS? The sound file doesn't _need_ to be renamed "sound.aiff" in order to work on the iPhone, unless you're using the code snippet exactly as is. For instance, it could just as easily be "frog.aiff". Adding the sound file to the revMobile plugin and then clicking "Deploy" bundles the sound with your app. QUESTION: is there a list of the system sounds that are available on the iPhone (for instance, the keyclick sound is one I'd like to use)? Snooping around on the web, I found the list of sounds shown below. set the beepSound to "/System/Library/Audio/UISounds/ct-keytone2.caf"
and it worked - meaning that this sound played when I executed a "beep" on the iPhone. beep-beep.caf - is the sound played when docking the iPhone. dtmf-0.caf - is the sound played when pressing 0 on the phone keypad. dtmf-1.caf - is the sound played when pressing 1 on the phone keypad. dtmf-2.caf - is the sound played when pressing 2 on the phone keypad. dtmf-3.caf - is the sound played when pressing 3 on the phone keypad. dtmf-4.caf - is the sound played when pressing 4 on the phone keypad. dtmf-5.caf - is the sound played when pressing 5 on the phone keypad. dtmf-6.caf - is the sound played when pressing 6 on the phone keypad. dtmf-7.caf - is the sound played when pressing 7 on the phone keypad. dtmf-8.caf - is the sound played when pressing 8 on the phone keypad. dtmf-9.caf - is the sound played when pressing 9 on the phone keypad. dtmf-pound.caf - is the sound played when pressing # on the phone keypad. dtmf-star.caf - is the sound played when pressing * on the phone keypad. lock.caf - is the sound played when pressing the Sleep/Wake button. mail-sent.caf - is the sound played when sending an email. new-mail.caf - is the sound played when an email is received. photoShutter.caf - is the sound played when taking a picture. sms-received1.caf - is the sound called Tri-tone, for text message receipt. sms-received2.caf - is the sound called Chime, for text message receipt. sms-received3.caf - is the sound called Glass, for text message receipt. sms-received4.caf - is the sound called Horn, for text message receipt. sms-received5.caf - is the sound called Bell, for text message receipt. sms-received6.caf - is the sound called Electronic, for text message receipt. unlock.caf - is the sound played when you "slide to unlock". Voicemail.caf - is the sound played when you receive a voicemail message. The .wav file is inside a folder called 'stimuli_X' which is inside another one called 'Resourcex' which is right beside the .rev file. The code for playing sounds works on my windows machine but when I try to play the sounds in an identical program on the Mac it just produces a kind of ‘click’ sound and does nothing else. It does not work on the iPad either. Can you enlighten me as to what might be going on? I would really appreciate any help you could give. On mobile devices you need to give the full path to the sound file you want to play, rather than just a relative path, you also don’t need the url keyword. Remember to includes your Resourcex folder in the Copy Files pane of the Standalone Application Settings too. Would the sounds listed above work on an iPad as well? if you are referring to the sound file in the lesson "sound.mp3", then yes, that file will play on an iPhone and iPad. Is there any way that the play command can override the device sleep? i.e. it continues playing even when the screen turns black already. Will really appreciate any insight. you should be able to play audio on iOS devices if you set the session/category correctly. Have a look at the dictionary entry "iphoneSetAudioCategory". Then try setting this to "playback". does NOT work on my iPhone 5s Simulator. Nor do any of the other sounds listed such as Tink.caf and alarm.caf. set the beepsound to specialFolderPath("resources") & "/AUDIO/Purr.aiff"
At least it does work in the simulator; it does not work on my iPhone 5s. answer "file does not exist"
answer "A playback issue occurred (" & e &")"